Summary: May 26 morning, Weishan Country Party Committee Secretary Zhang Maoru led 40 people Party and Government Delegation visited Shandong Coal Group for inspections on forefront experience of enterprise e-commerce, e-commerce platform construction, under the companion of Jining City High-tech Zone Party Committee Deputy Secretary, Committee Director You Weiping, High-Tech District Party Committee Deputy Secretary, Deputy Researcher Yin Feng, High-Tech Zone Party and Government Director Dong Zhen and other relevant leaders. 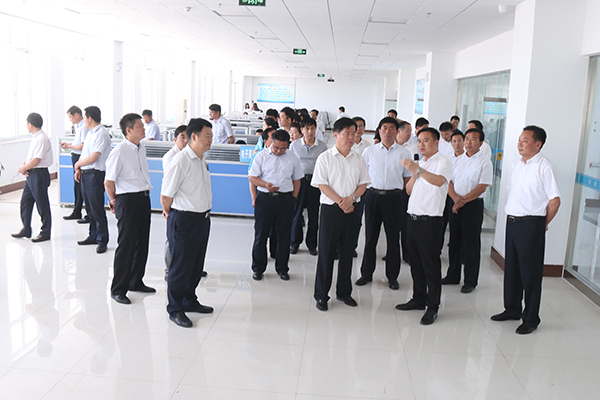 China Transport Group Deputy General Manager Han Yong, Li Zhenbo, Deputy General Manager Li Zhaopeng, Guan Chenghui and other leaders warmly received Secretary Zhang ans his entourages, and expressed a warm welcome for their inspection. May 26 morning, Weishan Country Party Committee Secretary Zhang Maoru led 40 people Party and Government Delegation visited Shandong Coal Group for inspections on forefront experience of enterprise e-commerce, e-commerce platform construction, under the companion of Jining City High-tech Zone Party Committee Deputy Secretary, Committee Director You Weiping, High-Tech District Party Committee Deputy Secretary, Deputy Researcher Yin Feng, High-Tech Zone Party and Government Director Dong Zhen and other relevant leaders. 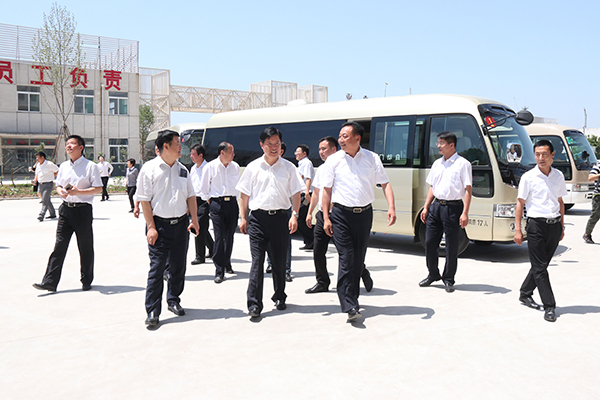 China Transport Group Deputy General Manager Han Yong, Li Zhenbo, Deputy General Manager Li Zhaopeng, Guan Chenghui and other leaders warmly received Secretary Zhang ans his entourages, and expressed a warm welcome for their inspection. Visiting Leaders, accompanied by Group Deputy General Manager Han and Li, visited the China Transport Group E-commerce Company, Cross-border E-commerce Company, Network Information Company, Software Technology Company, Weixin Agriculture Technology Company, High-Tech Intelligent Robot Exhibition Hall, etc. During the visiting, group advanced experience and outstanding achievements in e-commerce, cross-border e-commerce, e-commerce platform construction and e-commerce personnel training and other aspects which detailedly introduced by Group Deputy General Manager Li got affirmed and Praise by the leadership. Director Zhang said that the high-tech zone as the pioneer of industrial enterprises transformation and development in city and even province, walks in the forefront of the province promoting the development and integration of industrial enterprises, this time we, Weishan County Party and Government Delegation is to learning advanced experience of e -commerce development from high-tech zone, China Transport Group as a benchmarking enterprise of High-Tech Zone, Jining City, and even Shandong Province, has made outstanding achievements in the successful transformation of industrial enterprise in enterprise e-commerce and e-commerce platform construction , which is worthy of the city's industry enterprise to learn from. In the next step, we should promote the advanced development experience in Weishan County and guide more enterprises to embark on the road of e-commerce development! Finally, the visiting leaders watched the demonstration of the high-tech agricultural drone and intelligent robots which developed by Shandong Carter Intelligent Robot Co., Ltd., branch of China Transport Group, and spoke highly. Group Deputy General Manager Han said that thank the leaders of the high-tech zone for their long-term support and love to the development of China Transport Group. Thank director Zhang and other leaders for their recognition and encouragement to the development of China Transport Group. We must respond positively to national policies and make full use of unique advantages that the key support given by governments to China Transport Group on e-commerce innovation and development, to strengthen communication and cooperation with city's industrial enterprises, to share the advanced experience of enterprise transformation and development, to better lead the city's industrial enterprises to explore new ways of e-commerce development, make more positive contributions to the rapid development of city's economy!